At least 9 people have been killed following Typhoon Hato after a storm that left a trail of destruction across southern China, and battered Hong Kong's skyscrapers. Winds of more than 200km/h smashed into apartments across Macau, breaking doors and sending sheets of glass flying through the air. Rescuers have searched submerged cars for trapped people in the former Portuguese territory, while emergency services scrambled to respond to crisis calls. Fong Soi-kun, the director of Macau's Meteorological and Geophysical Bureau has resigned following the storm. Macau's government broadcaster TDM said Typhoon Hato was the strongest to hit the world's biggest gambling centre since 1968. Some casinos shut down while others were relying on back-up generators. One civil servant said: "The city looks like it was just in a war." More than 120 people were injured as the city was lashed by hurricane winds and pounding rain. 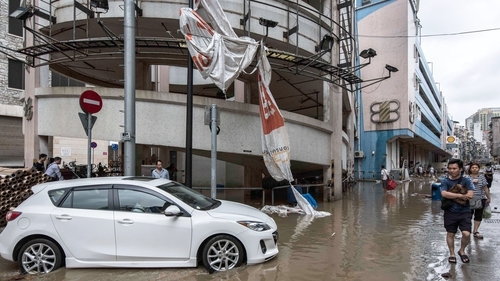 Transportation remains in chaos, with damage to both of Macau's ferry terminals and roads crammed with traffic, and schools, museums and public venues remain closed. Hato has since been downgraded to a tropical storm, and is about 680 km west of Hong Kong. It is expected to weaken further as it moves inland over China. Hato hit Hong Kong yesterday, uprooting trees, flooding streets, forcing hundreds of flights to be cancelled and halting financial trading. There were reports of 34 people injured in Hong Kong, which had not been hit by as strong a typhoon for five years. In the neighbouring southern Chinese province of Guangdong, at least four people died and around 27,000 were evacuated to temporary shelters, the official Xinhua news agency said. Nearly two million households were briefly without power. In Zhuhai, which borders Macau, about 275 homes had collapsed, with the typhoon causing an estimated 5.5 billion yuan (€700m) in damage, according to the state-run Beijing News. The city saw its strongest storm in 1962 when the eye of Typhoon Wanda passed over and gusts of 284km/h were recorded.